Mobile Carts Mobile Cart - 3 shelves & Drawer - wt. 40 lbs. 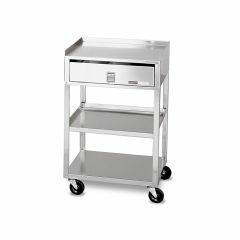 These Stainless Steel Mobile Carts by the Chattanooga Group come in 3 sizes. Perfect for use in a clinical setting or around the house. Whether you need to store hospital supplies, or just household objects, pick one up today and make your life a little easier. The 4002 Model MB Stainless Steel Cart 20"H x 19"W x 17"D is specially designed to hold the SS, E-2 and E-1 Hydrocollator heating units. 2 shelves, no drawer. 40lb shipping weight. The 4004 Model MB-T Stainless Steel Cart 30"H x 19"W x 17"D accommodates stationary heating, ultrasound and electrotherapy units. 3 shelves, no drawer. 93 lb shipping weight. The 4018 MB-TD Stainless Steel Cart 30"H x 19"W x 17"D accommodates stationary heating and electrotherapy units. The supply drawer provides convenient storage for clinic sundries. 3 shelves, 1 drawer. 93 lb shipping weight.